www.adobe.com • Retail Price: Pricing will differ from one to another based on institution FTE count. For large-scale deployments in K-12 classrooms and computer labs, Adobe recommends that schools purchase Creative Cloud products under an Adobe Education Enterprise Agreement (EEA). In early summer 2013, Adobe revamped its product line by converting its desktop applications into a subscription-based online experience known as Creative Cloud (CC). All applications except for Acrobat were upgraded or enhanced. Adobe introduced a new service called Typekit, providing CC subscribers with access to a growing library of high-quality fonts to use in their Web projects. Adobe also unveiled a new social community called Behance, where members can show work in progress, get feedback, and share resources for use with applications like InDesign CC and Flash Professional CC. Quality and Effectiveness: If you purchase a CC product subscription, not only do you get a full working application installed on your computer, it also updates and upgrades each subscribed product as it becomes available. The previous version of Adobe’s Creative Suite 6 gave licensed users free access only to “updates.” Upgrades containing new features, were available for an additional fee. Ease of Use: Most Adobe products share a similar look and feel, with common toolbars, drop-down menus, commands, panels, keyboard shortcuts, and tools like the eyedropper, smart guides, paste-in-place, and edit. Tools in one program may appear in several others. This means there is an increased comfort level and a decreased learning curve for users exploring each of the applications. Creative Use of Technology: Enhancement and new features make Creative Cloud products more versatile than ever before. 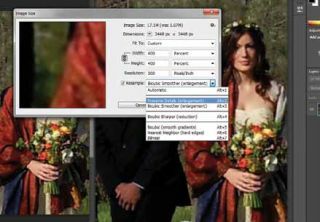 For example, Photoshop CC now features a shake reduction feature that helps sharpen an image by reducing the blur from handheld camera motion. InDesign features a QR Code creator (Quick Response Code) that lets you create a graphic data code that can link to a Web hyperlink, plain text, text message, email or business card. It can also be resized, colored and edited without compromising quality. Adobe Illustrator CC comes with a Touch Type tool for more precise type manipulation of each letter in a text selection. There are too many features and enhancements to mention them all in this brief overview. Suffice it to say that the Adobe CC brush has touched all tools except for Acrobat. Suitability for Use in a School Environment: School personnel installing Adobe CC products on local computers should understand that an Education Enterprise Agreement governs product installation in new ways. • Students work with the same industry standard tools that experts use. • Updates and upgrades are free and available upon release. • Creative activities produce output for mobile devices in addition to desktops, laptops, and print publications. OVERALL RATING: Students who work in collaborative settings with real-world, industry standard applications such as Adobe Creative Cloud can integrate digital media and technology tools into every project.